This very large barometer was made by the Utsuki Keiki Company in Yokohama, Japan in 1982. It's a high-quality barometer, has an approximately 6.5 inch dial face, and weighs 5.4 pounds. The mechanism was jammed when the shipment arrived from the ship breakers in India, but it was easily restored to working condition. 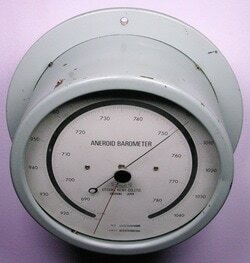 If anyone has an Utsuki Keiki catalog or information on this barometer, please contact me.